Cloverleaf interchanges between highways were great - back in the 1920s and 1930s when 30 miles per hour was considered fast, and way before people were texting while driving. Built in 1972 the interchange between Routes 128 and 93 also includes access to Washington Street, Mishawum Avenue and Commerce Way as well as weaves and merges for he close-by interchange with Route 28. 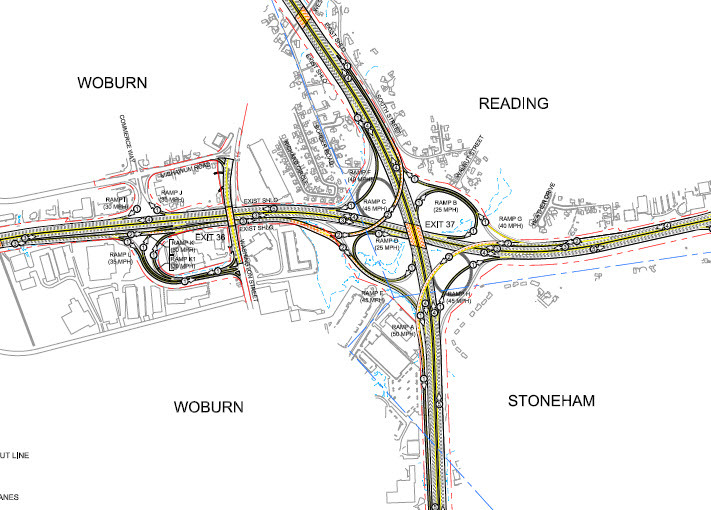 Today, the interchange is one of the worst not just here in Massachusetts but in the country, as well. 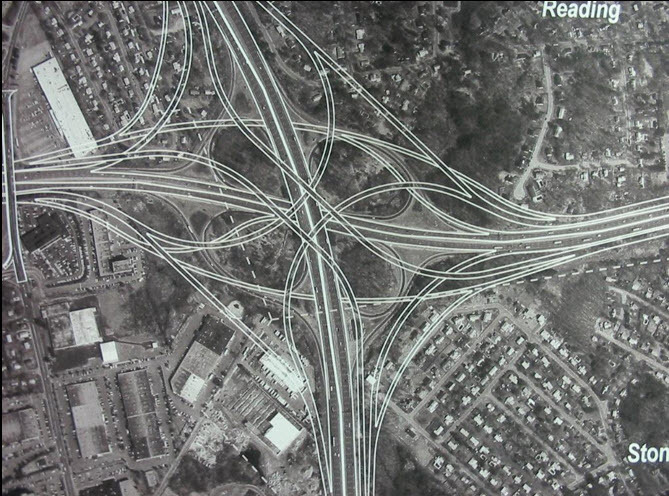 In 2002 MassDOT (Department of Transportation) publicly rolled out their plan to improve traffic flow, which included four "flyover" ramps, two as high as 110 feet. The plan called for the taking of 77 homes and large chunks of area business properties. It also carried a cost in the billions. The public outcry was predictable, and MassDOT quickly pulled the proposal, returning several years later with a new plan that eliminated two of the flyovers and almost all land-taking. In correspondence with a MassDOT representative I learned that the above was a "preferred alternative that was the outcome from task force which was convened as a result of the opposition to 2002 proposal. 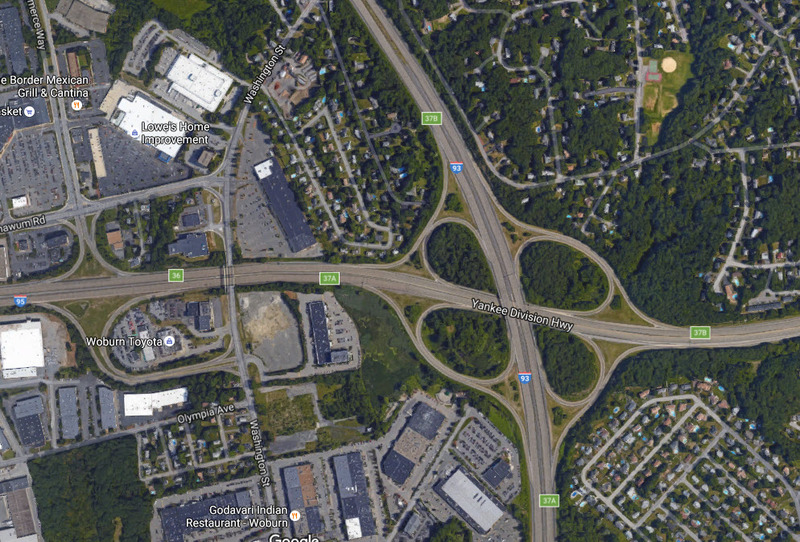 Further refinement of the alternative proposes to make the Route 28 interchange into a partial cloverleaf and add a 4th lane on I-95 NB from I-93 to Exit 40/Route 129." Sounds good, right? Well, MassDOT also said that "However, the project is dormant at this time and is not likely to move forward in the forseeable future." Despite - or maybe because of - this outlook, MassDOT still has a website containing tons of information on the current state of the interchange and of ideas - and prospects, however grim - for how to help the 450,000 cars, trucks, buses and other vehicles that use it every day do so safely and efficiently.